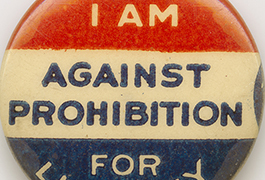 While auditing a course at SMU on twentieth-century United States presidential politics, collector Hervey A. Priddy ventured into a small shop in New Orleans that specialized in nineteenth- and twentieth-century political Americana. The buttons, ribbons, and pins he saw there brought to life the candidates, issues, and elections he had been studying. Several hours later, Priddy recalls, he walked out of the shop with a sack full of buttons and a brand new passion—collecting campaign memorabilia. 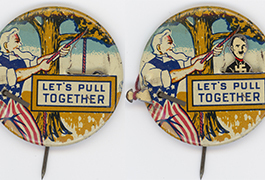 The Hervey A. Priddy Collection of American Presidential and Political Memorabilia at DeGolyer Library now includes more than 500 buttons, pins, ribbons, posters, broadsides, textiles, ceramics, tokens, inaugural medals, programs, bumper stickers, toys, and other campaign commemoratives from the early nineteenth century to the present. 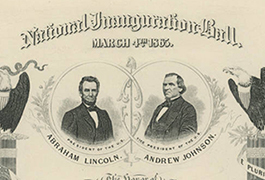 Over 200 years of political history are represented here, and the cultural artifacts of the campaigns, candidates, issues, and elections chronicle the development of our political system and democracy in America. 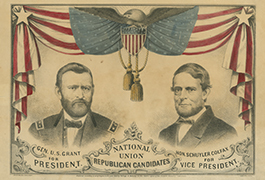 The brass encased ferrotypes from the 1860 and 1864 elections are a particular favorite in Mr. Priddy’s collection. 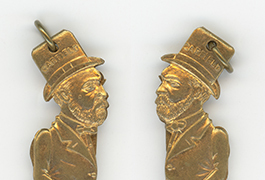 These nineteenth-century campaign lapel devices were usually about one inch in diameter, encased in brass, and punched with a hole so they could be suspended from the lapel. 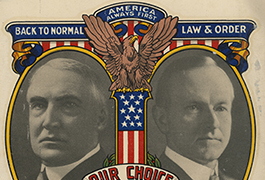 The ferrotypes featured the presidential nominee’s image on one side and the vice presidential nominee’s on the other, familiarizing distant voters with the candidates’ names and faces.